My name is Kunio. 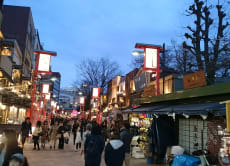 Through my experience as a tour guide, I became familiar and knowledgeable about the popular areas in Tokyo. I am also happy to take you around outside of Tokyo, such as Kamakura, Hakone, Mt. Fuji or Nikko. Do you like walking, shopping, eating, drinking, singing or just sightseeing? Please let me know your interest or request so that I can make a customized tour plan just for you.